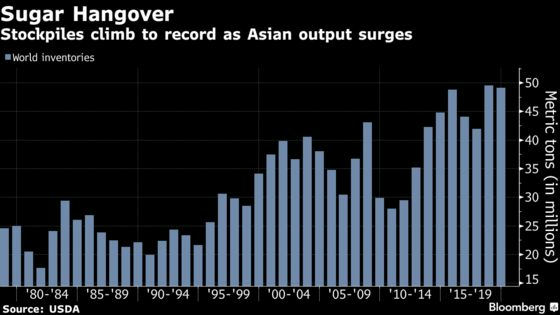 (Bloomberg) -- Sugar stockpiles are poised for a record as slowing demand growth and surging production creates the worst-performing commodity of 2018. Consumers have become increasingly wary of the health impact of their sweet tooth, and companies from canned-fruit maker Del Monte Foods Inc. to snack-food seller Mondelez International Inc. are touting products made with less sugar. While global consumption is still rising, the pace of growth has slowed to an average 1.4 percent in recent seasons, down from 1.7 percent over the past decade, according to researcher Green Pool Commodity Specialists. That’s coming at a time when production is booming, especially in India, the world’s No. 2 producer. Farmers in Thailand are also collecting massive crops. World stockpiles are set to swell to the highest ever this season and stay near the record next year, according to the U.S. Department of Agriculture. Sugar futures in New York have already slumped 25 percent in 2018. That’s the biggest loss on the Bloomberg Commodity Index, which tracks returns for 22 components. On Monday, raw sugar for October delivery fell 1 percent to 11.4 cents a pound on ICE Futures U.S. in New York. Investors are setting up for more declines. In the week ended July 3, money managers more than tripled their net-short position, or the difference between bets on a price increase and wagers on a decline, to 54,736 futures and options, according to U.S. Commodity Futures Trading Commission data released Monday. The move came as short holdings increased 15 percent, while long bets fell almost 7 percent. Global production will top demand by 19.6 million metric tons in the 12 months that end Sept. 30, the biggest overhang ever, Brisbane, Australia-based Green Pool said in a report last month. The excess would be more than enough to meet annual demand in China, the world’s top importer. After farmers collected a mammoth crop, the Indian Sugar Mills Association said July 3 that processors are seeking to increase export quotas to a record 6 million tons. The group estimates the country’s output at as much as 32 million tons, a gain of 58 percent from a year earlier. 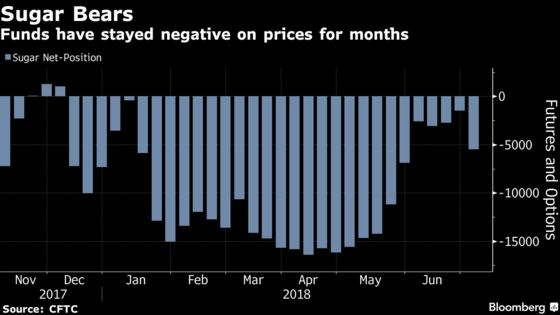 Meanwhile in Brazil, surging ethanol stockpiles and tumbling prices for the biofuel mean cane millers could process more of the crop into sugar. Of course, crops can still fail, especially if the weather turns worse than expected. Dry conditions have hurt plants in Brazil’s Center-South, the world’s biggest producing region. The potential for an EL Nino weather pattern later this year could also mean some damage to Asian crops. But in a market where demand slowing, small supply shocks can often be absorbed. While health concerns and taxes on sugary drinks that erode consumption have been more pronounced in developing economies, Green Pool said that these factors are now being “replicated” in emerging markets.